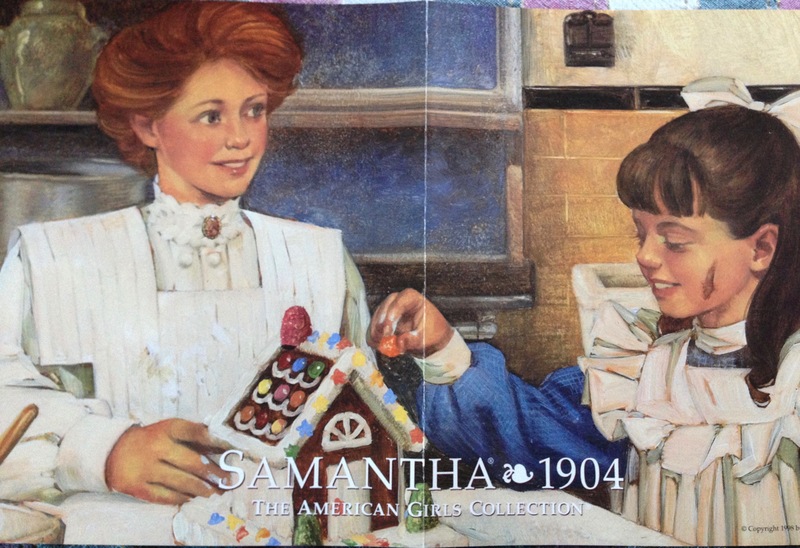 It’s rummage sale season again, and is there anything more satisfying that unearthing some American Girl treasures? I think not! Today Brianna and I hit a moving sale that was managed by an estate sale company. To me, that usually means high prices. Some estate sale companies also sell online. 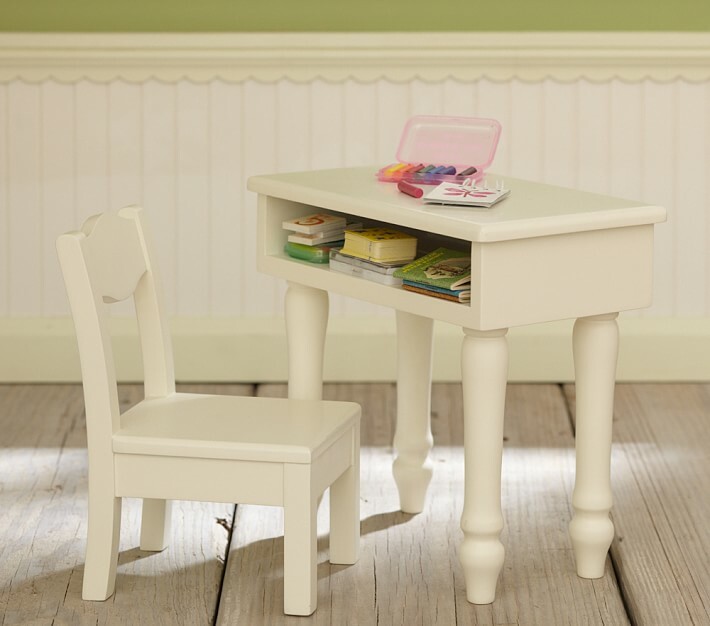 The craigslist ad mentioned American Girl clothes but no dolls. We were sure to arrive at the opening of the sale. We walked in the door and I asked where the doll clothes were. I did not run anyone down (in case you were wondering…) nor was anyone else interested in them. 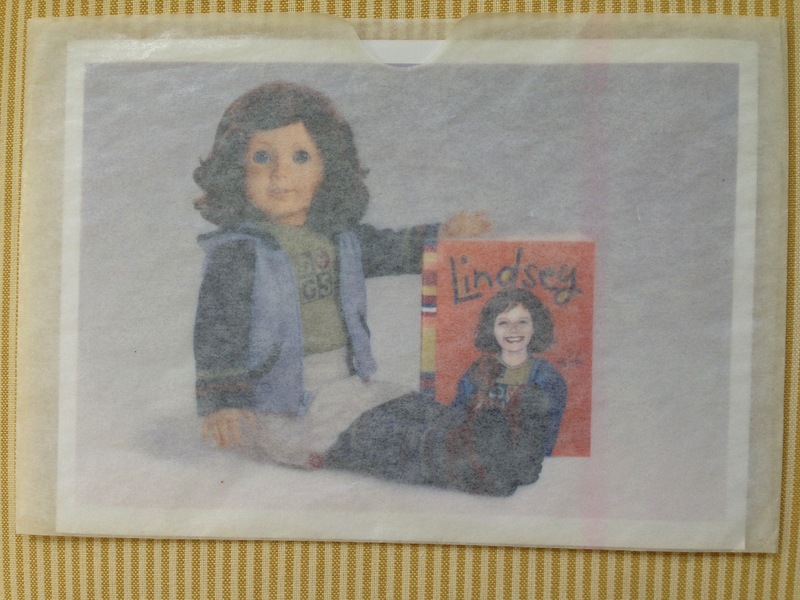 In one of the bedrooms there was a little box of American Girl clothes all organized in Ziploc bags. Kirsten’s On the Trail outfit! This is one of my favorite Kirsten outfits. The fabric is so old-timey, yet soft and comfy. Caroline is standing in as Kirsten — she is my most Scandi-looking girl. The outfit did not come with the shawl. That’s Ok.. I often don’t use those pieces anyway. I love the rosemaling-style detail on the apron. It’s a pretty outfit without the apron, too. 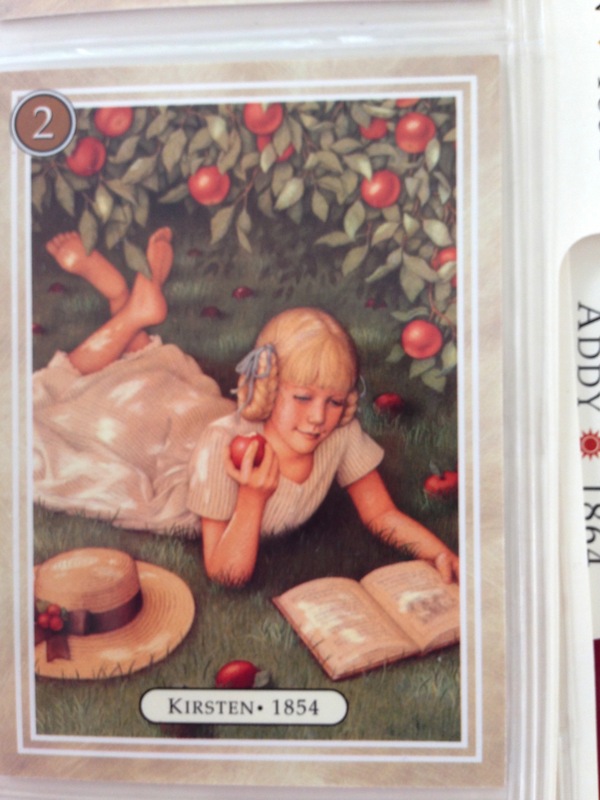 I look forward to trying it on Addy. I bought it for $5.00! I also got a Pleasant Company-era brush for .25. It looks like the current brushes except the wood is a cherry color. I bought more, too, but you will have to wait for more posts. I wanted to showcase this awesome dress. 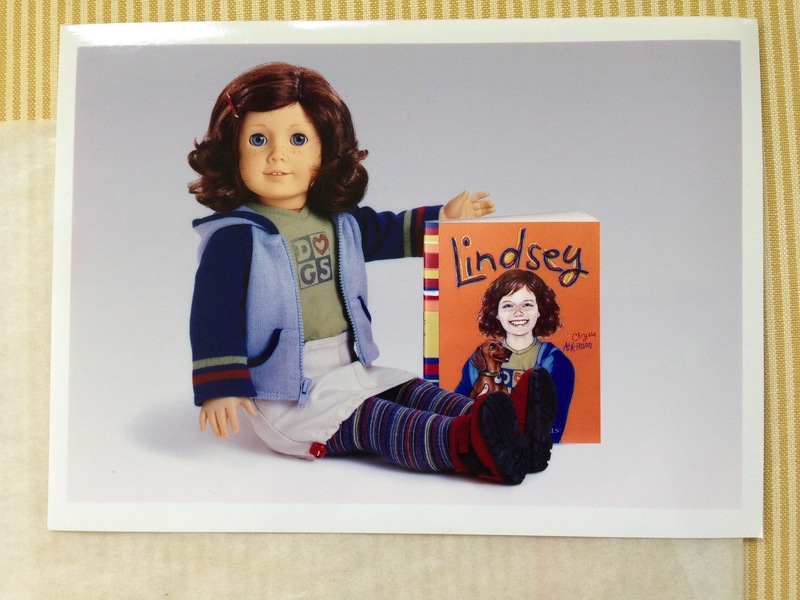 This entry was posted in Kirsten, Rummage Treasures and tagged American Girl, Rummage sales on June 16, 2017 by Jen. I am still catching up with Rummage Treasures from this summer. Today I want to show you some terrific Pleasant Company posters. These are from 1998 and there is one for each of the historical characters out at the time. Samantha has a great scene perfect for the holiday season. I’m giving you two pictures of Addy in Philadelphia. I love the colors in this poster! 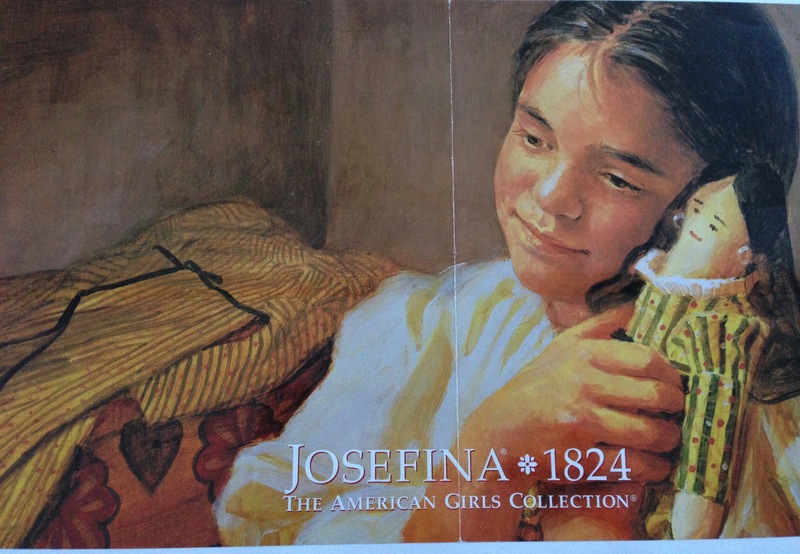 Here is Josefina – this poster is framed and hanging in Brianna’s room. 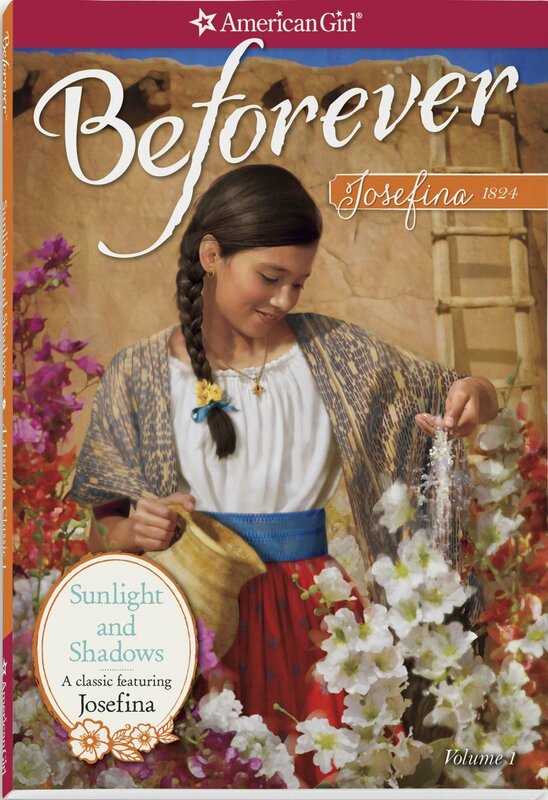 I think Josie looks quite sweet and a lot younger than her current image on the book covers. 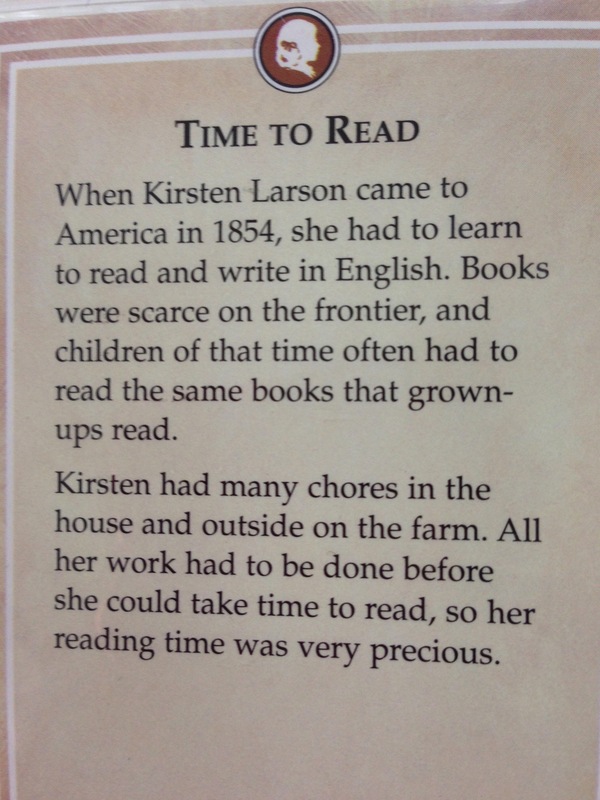 We also have a Kirsten poster but the color palette is very pale and subtle and doesn’t photograph well. 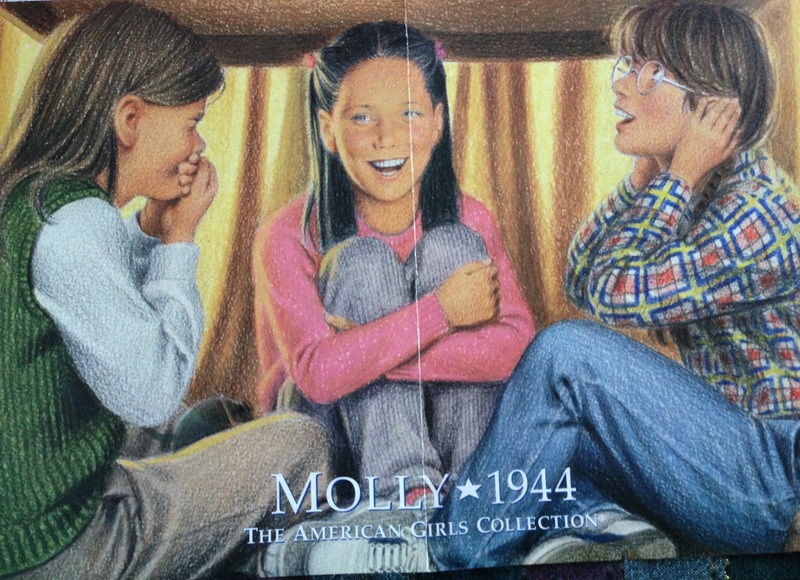 These posters came from the same sale where we found the American Girl trading cards. The family was happy to have someone interested in them and we took everything home for about $ 5.00. 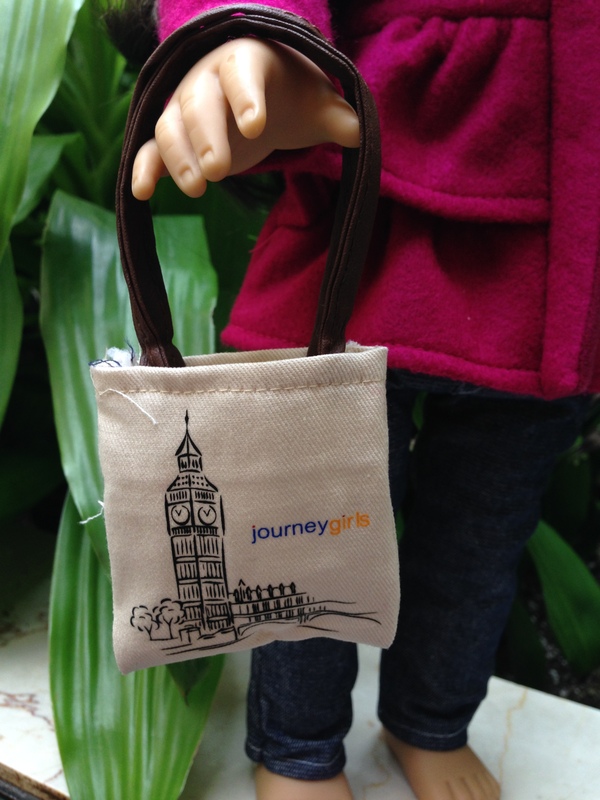 Finding American Girl treasures is always a thrill! 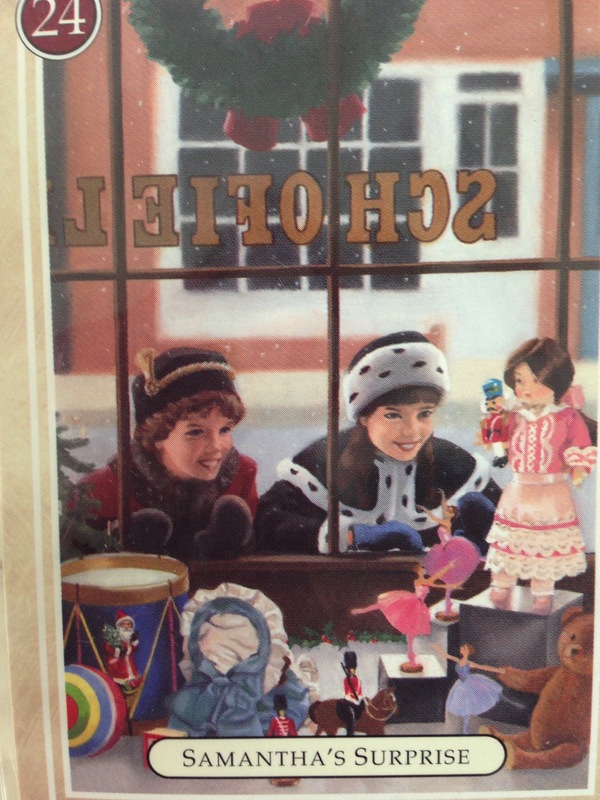 This entry was posted in Pleasant Company, Rummage Treasures and tagged American Girl, Rummage sales on December 18, 2015 by Jen. Hello everyone! It’s Brianna here, and today I have a very exciting post on Jess’s Kayak Set and Nicki’s Duffel-bag. Jess was the GOTY of 2006 and her story mainly takes place in Belize which is in Latin American. Nicki was the GOTY of 2007 and her story takes place in Colorado. I hope you enjoy this post! 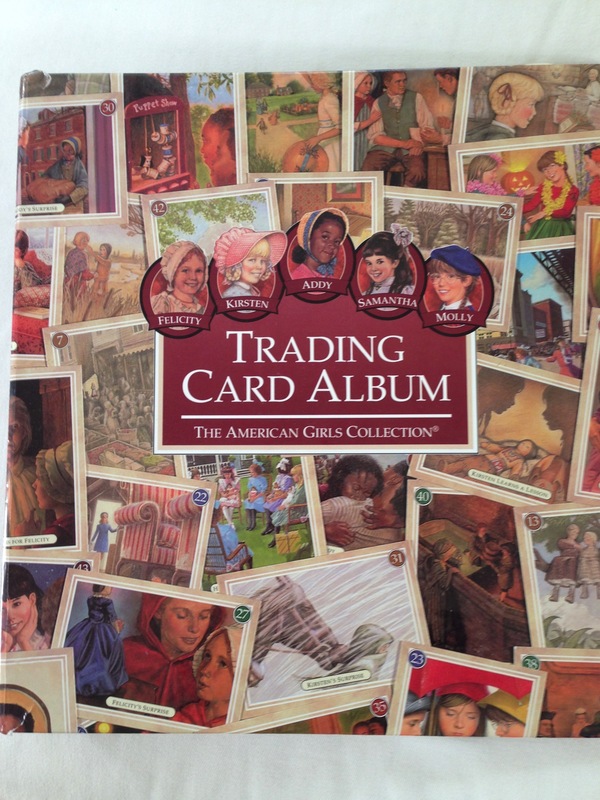 So, today Jen and I were driving around looking at rummage sales for American Girl Items, when we found a rummage that had 16 year old girl [tip: rummages with older girls ages 12 – 17 is a usually a good place to look for AG items.] 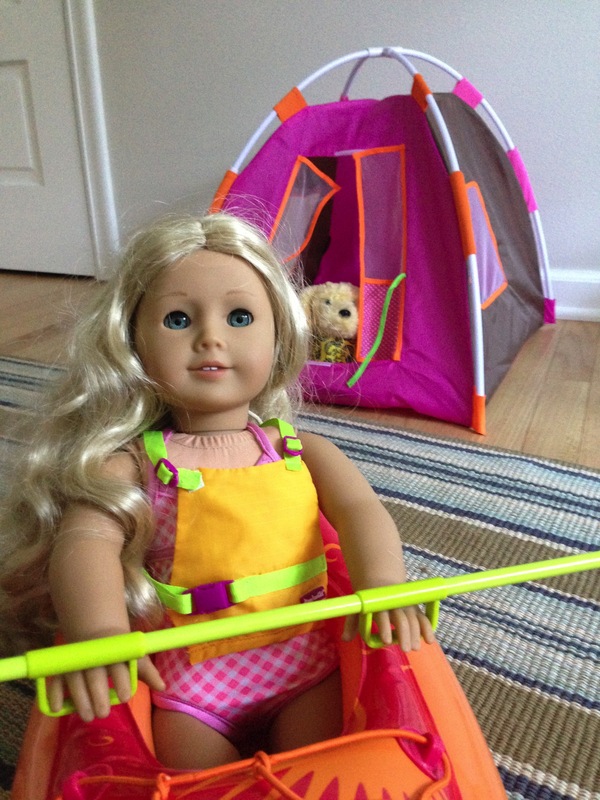 She had Jess’s Kayak Set, which is now quite a rare item to find at sales. She was selling it for $25 which was an ok price, I would priced it around $20. 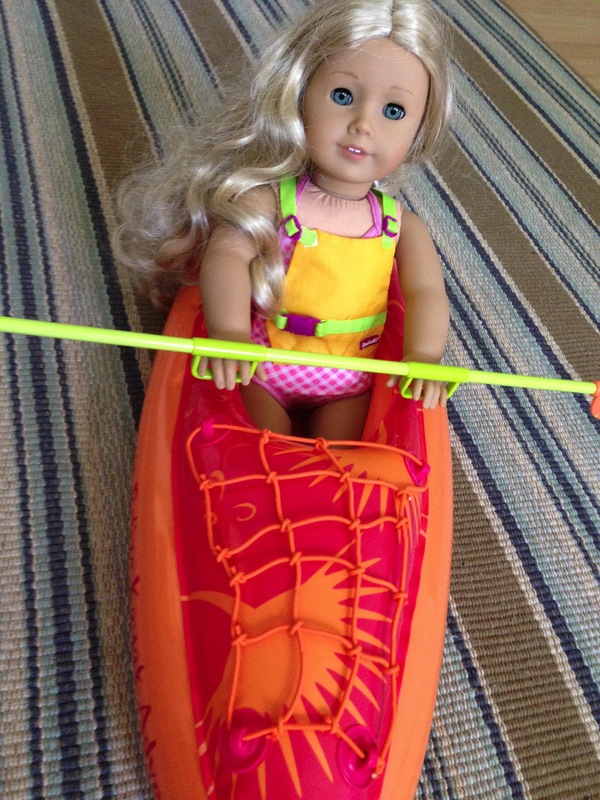 The Kayak Set came with a kayak that AG dolls can fit in, a rainstick, and a life vest. 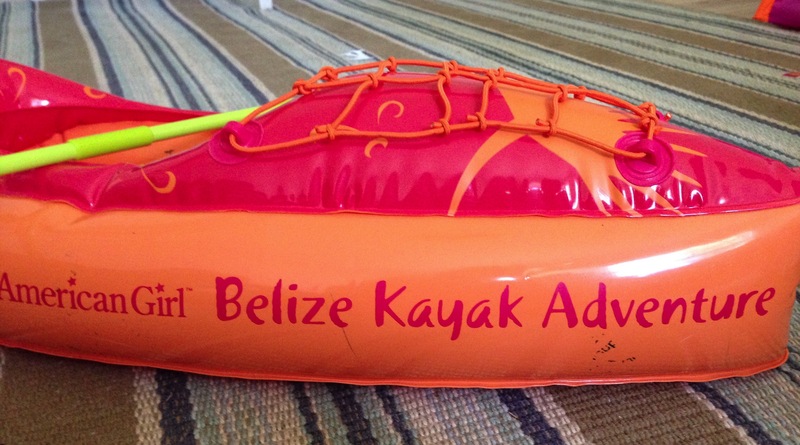 On the side of the kayak it says Belize Kayak Adventure. On the front of the kayak it has a storage net. The kayak itself is inflatable which I think is pretty cool! The rainstick makes music and has two handles on it that American Girls can put their hands through to paddle. The life vest looks very realistic and it fits the American Girls perfectly! Of course, Jen and I had to buy it! Caroline insists to the other American Girls at our house that she has to go first because she is the sailor in the family. We also, found Nicki’s Duffel Bag at the rummage sale. The Duffel Bag was originally part of Nicki’s Ranch Outfit. 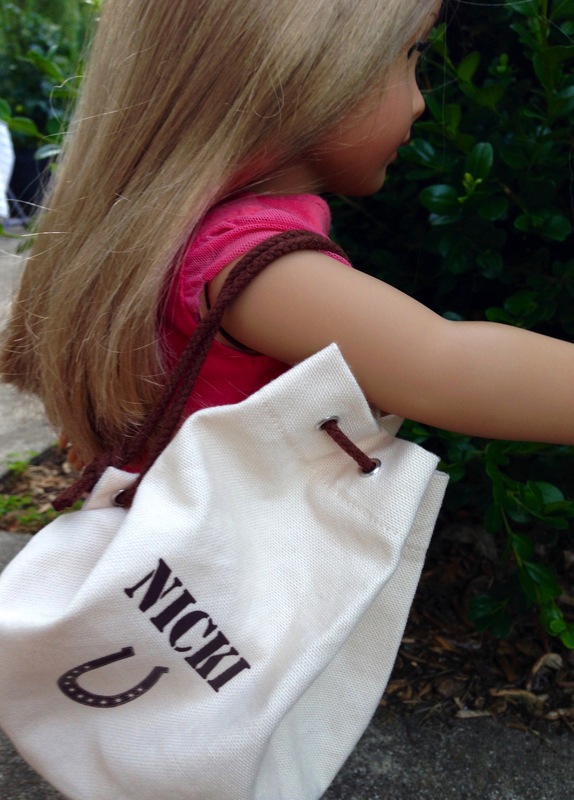 The Duffel Bag has Nicki’s name printed below a symbol of a horseshoe! The Duffel Bag has brown drawstrings and it the bag itself is cream colored heavy canvas. So, those are today’s rummage treasures. Keep your eyes peeled for more posts coming soon! 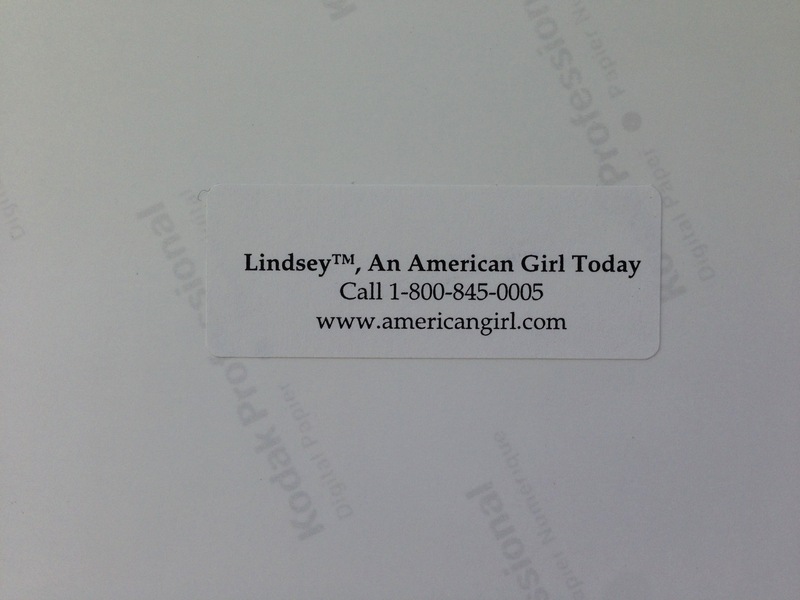 This entry was posted in Jess, Rummage Treasures and tagged American Girl, Jess American Girl, Nicki American Girl, Rummage sales on August 1, 2015 by Jen. Brianna and I have done a bit of rummage sale shopping this summer. 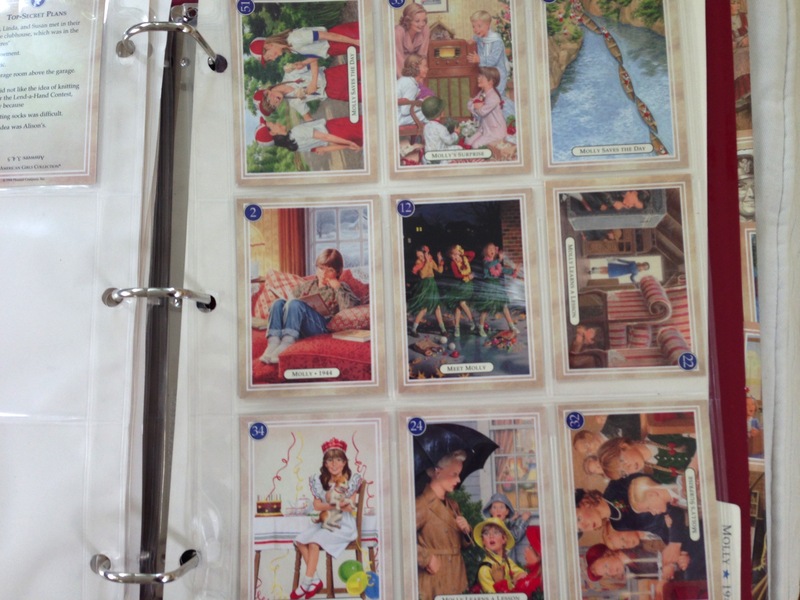 We have found a number of “throwback” items that are unusual. A waxed envelope jammed in with a variety of kid books. 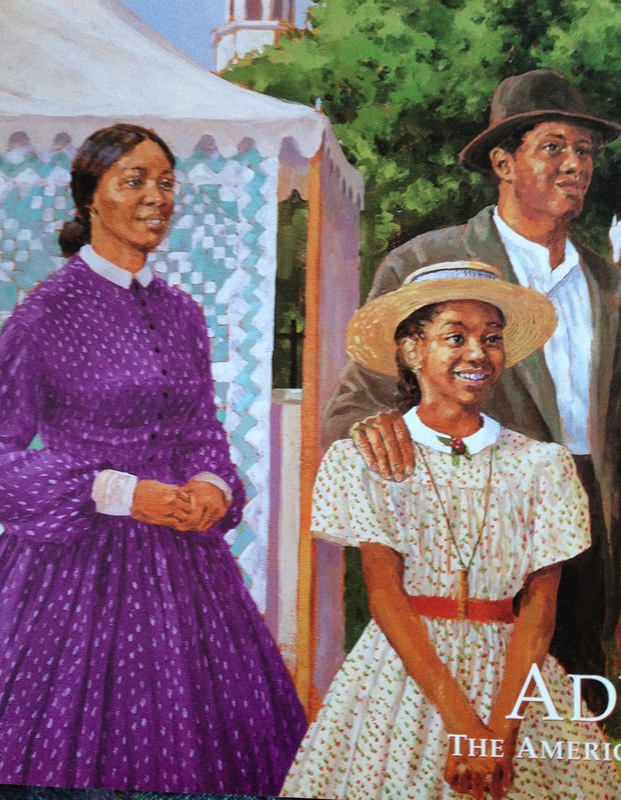 In it was a photographer’s glossy photo of…. I am wondering whether any of the more experienced AG collectors like Nonna, Xyra or Heather have ever seen one of these and what the original purpose might have been. It is hanging in a frame in Brianna’s room now. 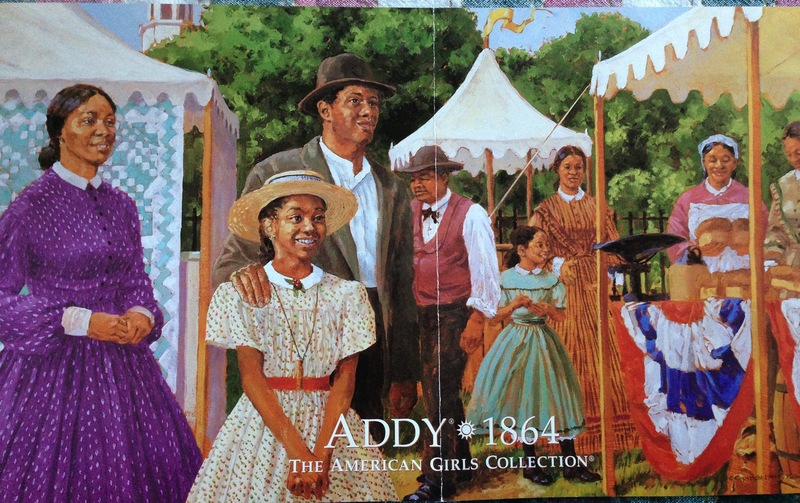 The family holding the sale has a daughter (now grown) who played Molly in an AG fashion show in Chicago. 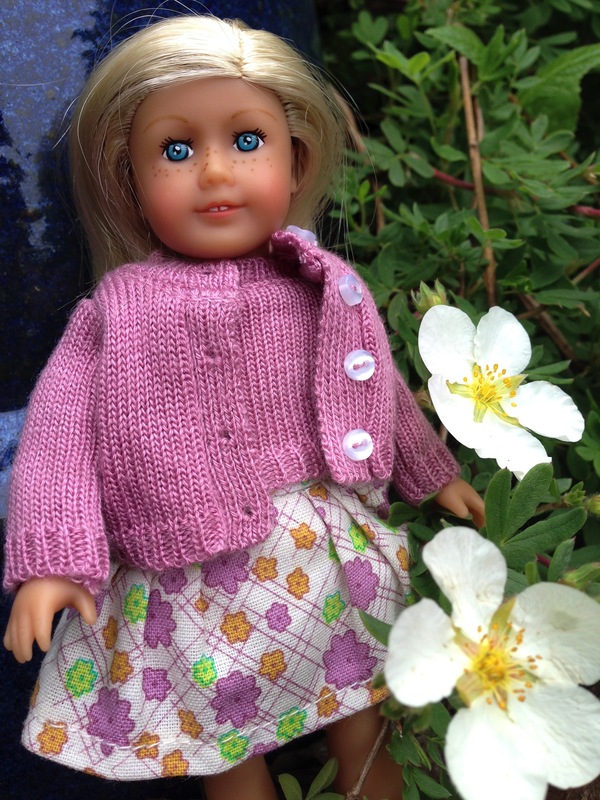 This entry was posted in Rummage Treasures and tagged American Girl, Rummage sales on July 15, 2015 by Jen.